The power of modern search engines is undeniable: you can summon knowledge from the internet at a moment’s notice. Unfortunately, this superpower isn’t omnipresent. There are many situations where search is relegated to strict keyword search, or when the objects aren’t text, search may not be available. Furthermore, strict keyword search doesn’t allow the user to search semantically, which means information is not as discoverable. Today, we share a reproducible, minimally viable product that illustrates how you can enable semantic search for arbitrary objects! Concretely, we will show you how to create a system that searches python code semantically — but this approach can be generalized to other entities (such as pictures or sound clips). The search query presented is “Ping REST api and return results”. However, the search returns reasonable results even though the code & comments found do not contain the words Ping, REST or api. This illustrates the power of semantic search: we can search content for itsmeaning in addition to keywords, and maximize the chances the user will find the information they are looking for. The implications of semantic search are profound — for example, such a procedure would allow developers to search for code in repositories even if they are not familiar with the syntax or fail to anticipate the right keywords. More importantly, you can generalize this approach to objects such as pictures, audio and other things that we haven’t thought of yet. The goal is to map code into the vector space of natural language, such that (text, code) pairs that describe the same concept are close neighbors, whereas unrelated (text, code) pairs are further apart, measured by cosine similarity. There are many ways to accomplish this goal, however, we will demonstrate the approach of taking a pre-trained model that extracts features from code and fine-tuning this model to project latent code features into a vector space of natural language. One warning: We use the term vector and embeddinginterchangeably throughout this tutorial. Sequence-to-sequence models: It will be helpful to review the information presented in a previous tutorial. Peruse this paper at a high level and understand the intuition of the approach presented. We draw on similar concepts for what we present here. This tutorial will be broken into 5 concrete steps. These steps are illustrated below and will be a useful reference as you progress throughout the tutorial. After completing the tutorial, it will be useful to revisit this diagram to reinforce how all the steps fit together. Each step 1–5 corresponds to a Jupyter notebook here. We will explore each step in more detail below. The folks at Google collect and store data from open-source GitHub repositories on BigQuery. This is a great open dataset for all kinds of interesting data-science projects, including this one! When you sign up for a Google Cloud account, they give you $300 which is more than enough to query the data for this exercise. Getting this data is super convenient, as you can use SQL queries to select what type of files you are looking for as well as other meta-data about repos such as commits, stars, etc. The steps to acquire this data are outlined in this notebook. Luckily, some awesome people on the Kubeflow team at Google have gone through these steps and have graciously hosted the data for this exercise, which is also described in this notebook. After collecting this data, we need to parse these files into (code, docstring) pairs. For this tutorial, one unit of code will be either a top-level function or a method. We want to gather these pairs as training data for a model that will summarize code (more on that later). We also want to strip the code of all comments and only retain the code. This might seem like a daunting task, however, there is an amazing library called ast in Python’s standard librarythat can be used to extract functions, methods and, docstrings. We can remove comments from code by converting code into an AST and then back from that representation to code, using the Astor package. Understanding of ASTs or how these tools work is not required for this tutorial, but are very interesting topics! 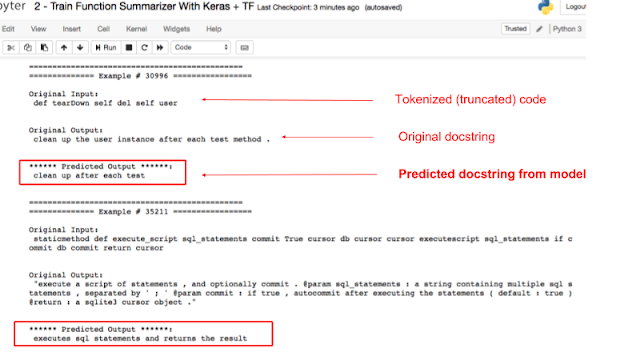 """Apply tokenization using spacy to docstrings.""" """A very basic procedure for tokenizing code strings.""" """Extract (function/method, docstring) pairs from a given code blob.""" To prepare this data for modeling, we separate the data into train, validation and test sets. We also maintain files (which we name “lineage”) to keep track of the original source of each (code, docstring) pair. Finally, we apply the same transforms to code that does not contain a docstring and save that separately, as we will want the ability to search this code as well! 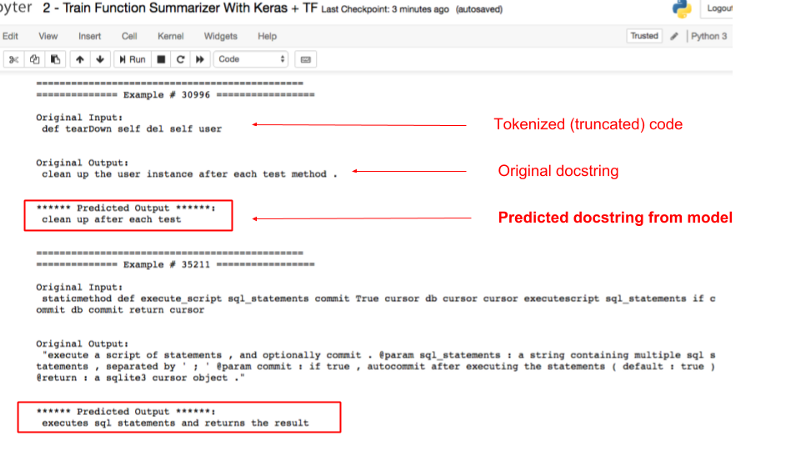 Conceptually, building a sequence-to-sequence model to summarize code is identical to the GitHub issue summarizer we presented previously — instead of issue bodies we use python code, and instead of issue titles, we use docstrings. However, unlike GitHub issue text, code is not natural language. To fully exploit the information within code, we could introduce domain-specific optimizations like tree-based LSTMs and syntax-aware tokenization. For this tutorial, we are going to keep things simple and treat code like natural language (and still get reasonable results). Building a function summarizer is a very cool project on its own, but we aren’t going to spend too much time focusing on this (but we encourage you to do so!). The entire end-to-end training procedure for this model is described in this notebook. We do not discuss the pre-processing or architecture for this model as it is identical to the issue summarizer. We can see that while the results aren’t perfect, there is strong evidence that the model has learned to extract some semantic meaning from code, which is our main goal for this task. We can evaluate these models quantitatively using the BLEU metric, which is also discussed in this notebook. It should be noted that training a seq2seq model to summarize code is not the only technique you can use to build a feature extractor for code. For example, you could also train a GAN and use the discriminator as a feature extractor. However, these other approaches are outside the scope of this tutorial. 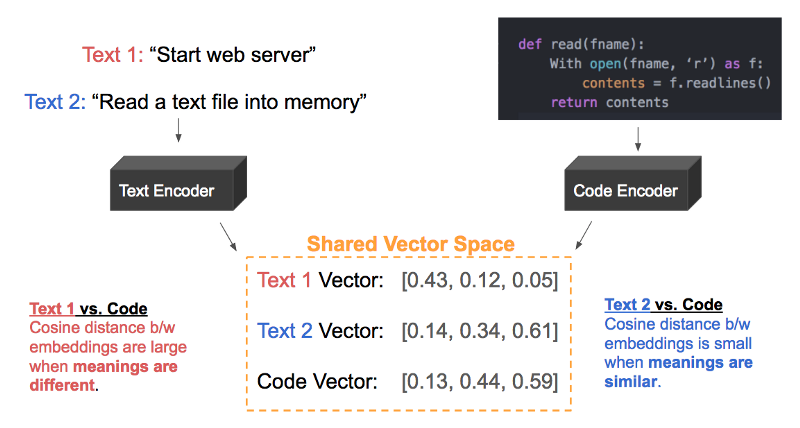 Now that we have built a mechanism for representing code as a vector, we need a similar mechanism for encoding natural language phrases like those found in docstrings and search queries. There are a plethora of general purpose pre-trained models that will generate high-quality embeddings of phrases (also called sentence embeddings). This article provides a great overview of the landscape. 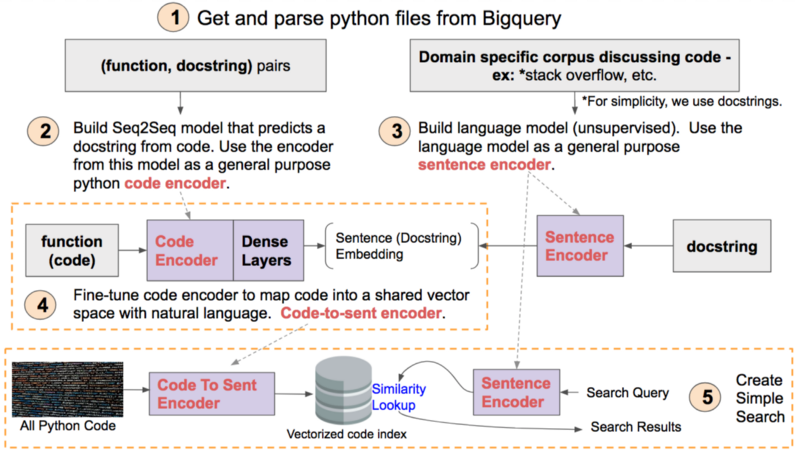 For example, Google’s universal sentence encoder works very well for many use cases and is available on Tensorflow Hub. Despite the convenience of these pre-trained models, it can be advantageous to train a model that captures the domain-specific vocabulary and semantics of docstrings. 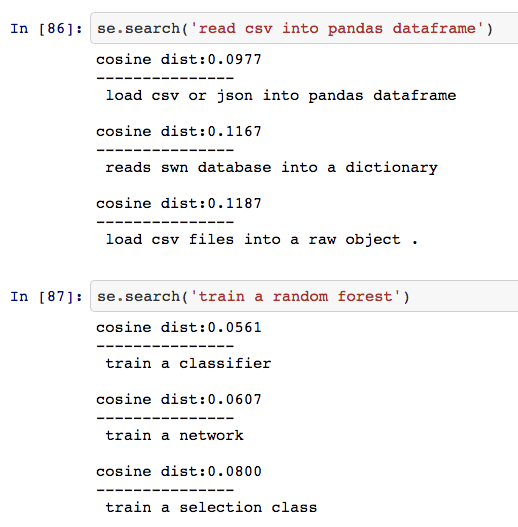 There are many techniques one can use to create sentence embeddings. These range from simple approaches, like averaging word vectors to more sophisticated techniques like those used in the construction of the universal sentence encoder. For this tutorial, we will leverage a neural language model using an AWD LSTM to generate embeddings for sentences. I know that might sound intimidating, but the wonderful fast.ai library provides abstractions that allow you to leverage this technology without worrying about too many details. Below is a snippet of code that we use to build this model. For more context on how this code works, see this notebook. It should be noted that this is only a sanity check — a more rigorous approach is to measure the impact of these embeddings on a variety of downstream tasks and use that to form a more objective opinion about the quality of your embeddings. More discussion about this topic can be found in this notebook. After we train the frozen version of this model, we unfreeze all layers and train the model for several epochs. This helps fine-tune the model a little more towards this task. You can see the full training procedure in this notebook. Finally, we want to vectorize the code so we can build a search index. For evaluation purposes, we will also vectorize code that does not contain a docstring in order to see how well this procedure generalizes to data we have not seen yet. Below is a code snippet (taken from this notebook) that accomplishes this task. Note that we use the ktext library to apply the same pre-processing steps that we learned on the training set to this data. After collecting the vectorized code, we are ready to proceed to the last and final step! Now that you have built your search index of code vectors, you need a way to turn a string (query) into a vector. To do this you will use the language model from Part 3. To make this process easy we provided a helper class in lang_model_utils.py called Query2Emb, which is demonstrated in this notebook. """Organizes all the necessary elements we need to make a semantic search tool.""" This is a pre-computed search index. This dataframe contains meta-data for search results. a search query. Ex: "read data into pandas dataframe"
the number of nearest neighbors to return. Defaults to 2. Congratulations! You have just learned how to create semantic search. I hope it was worth the journey. Wait, But You Said Search of Arbitrary Things? Even though this tutorial describes how to create semantic search for code, you can use similar techniques to search video, audio, and other objects. Instead of using a model that extracts features from code (part 2), you need to train or find a pre-trained model that extracts features from your object of choice. The only prerequisite is that you need a sufficiently large dataset with natural language annotations (such as transcripts for audio, or captions for photos). We believe you can use the ideas you learned in this tutorial to create your own search and would love to hear from you to see what you create (see the getting in touch section below). The techniques discussed in this blog post are simplified and are only scratching the surface of what is possible. 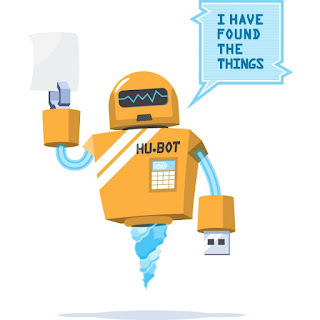 What we have presented is a very simple semantic search — however, in order for such a search to be effective, you may have to augment this search with keyword search and additional filters or rules (for example the ability to search a specific repo, user, or organization and other mechanisms to inform relevance). There is an opportunity to use domain-specific architectures that take advantage of the structure of code such as tree-lstms. Furthermore, there are other standard tricks like utilizing attention and random teacher forcing that we omitted for simplicity. One part we glossed over is how to evaluate search. This is a complicated subject which deserves its own blog post. In order to iterate on this problem effectively, you need an objective way to measure the quality of your search results. This will be the subject of a future blog post.